Old map by MERCATOR -Orbis Terrae Compendiosa Descriptio. 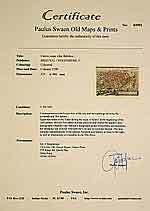 Publisher: MERCATOR, R. / HONDIUS, J. Title: Orbis Terrae Compendiosa Descriptio. Size: 11.2 x 20.3 inches. Condition: Good impression. The map has been underlaid to prevent farther splitting of the centerfold. Overall in very good condition. In 1587 Rumold Mercator issued a reduced version of his father's great modern world map, which was first issued in an edition of Strabo's Geography. 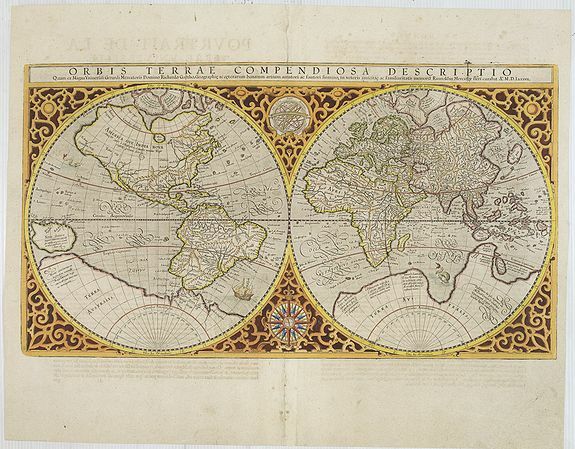 It first appeared in a Mercator atlas eight years later, in 1595. This is an example of a later issue as can be seen from the cracks that appeared in the title portion of the plate. It is a double-hemisphere map, within an ornate frame, with California shown as part of the mainland, the distinctive bulge in South America and the kingdoms of Beach, Lucach and Maletur as part of the Terra Australis. Text on the back in French.